This traditional leather chair and ottoman will add a touch of style and comfort to your living room or den. 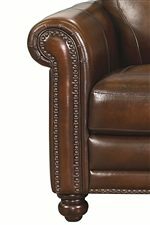 The plush seating ensures you'll stay cozy, while details such as picture frame seams on cushions, and antiqued brass nail head trim on the rolled arms make this chair a sophisticated choice for your traditional home. 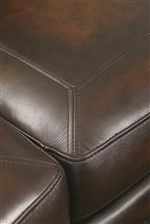 The rectangular ottoman offers a comfortable footrest, with the same attention to design details. This high quality leather chair and ottoman combo is perfect for everyday use in your busy home. The Hamilton Traditional Leather Chair and Ottoman with Nail Head Trim by Bassett at AHFA in the area. Product availability may vary. Contact us for the most current availability on this product. 3959-01S Ottoman 1 22.5" 29.5" 18"
3959-12S Chair 1 39.5" 37" 38"